Cubs fans, heed my advice. If Dusty Baker taught me anything in his four years in Chicago, it's that "the past is for losers and cowards, and I ain't neither." While I could argue against the first part of the statement, I understand the gist of it. And even though you truly don't know where you're going until you know where you've been, sometimes you just have to move forward and forget the past. With that said, there are plenty of reasons to hold out hope that the Cubs can make history, starting tonight. I already covered Harden in a previous post, but it's worth repeating. 10-2 overall, but against NL teams he went 7-1 including wins against the Phillies and Brewers, both are in the playoffs this year. Harden was on the wrong side of the 0-2 comeback in 2003. He's looking for payback. Many people ridiculed Lilly's four-year $40 million contract when it was signed, but he's been big money for the Cubs, especially in the second half. Lilly finished the season with a 3-1 mark in September and an 8-3 record in the second half with a 3.32 ERA. Not only will Lilly take that into Game 4, he'll be pitching in pitcher-friendly Dodger Stadium. That softens the blow a little. I hope Kosuke Fukudome is going to be wearing some comfortable baseball pants because I doubt he'll be seeing any playing time. In fact, K-Fuk won't get a chance to face fellow countryman Hiroki Kuroda, Mark DeRosa will get the start in right field as Mike Fontenot gets the start at second base. Fontenot, who was acquired in the Sammy Sosa trade to Baltimore, has been one of the Cubs' best reserve players this year. He posted a .909 OPS this season and hit only one less homer than the Fuk in almost half the at-bats. The 2003 Florida Marlins did it to us. They won three straight games with their backs against the walls and won the NL pennant and did it against Carlos Zambrano, Mark Prior and Kerry Wood. The 1984 San Diego Padres did it to us, too. They won three-in-a-row after being down 0-2 to Ryne Sandberg, Rick Sutcliffe and the rest of the gang. All they had was Tony Gwynn...and Steve f*cking Garvey. A few years ago, I coined the concept that this would be the year that Cubdom would strike back - loosely based off The Empire striking back in Star Wars. Ryan Dempster hasn't had back-to-back bad starts all season. Why would he do it now? After Harden and Lilly take care of business, the Cubs will have their home-field ace, a lot of positive energy and hopefully an excited crowd in Wrigleyville. And then possibly Big Z coming out of the pen to go with Carlos Marmol and Kerry Wood. Lou's gotta pull out all the stops. And I expect him to do so. Ladies and gentlemen, these are the Chicago Cubs. You should already know what to expect: heartbreak followed by hope. You've been in this position before. You've been ridiculed by friends and co-workers for being a Cubs fan. Your girlfriend probably is angered by the fact that from April through October, your primary focus is on 25 guys instead of her. You've already wasted six months of your life, what's another few games? Do you have a hot date tonight? Probably not. So watch the game. Have a beer (or two or three) and a hot dog (or two or three). 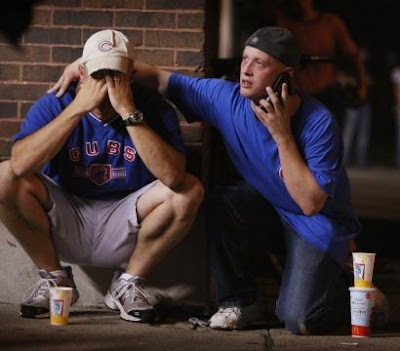 If you're off the bandwagon and the Cubs somehow do the unthinkable, don't even think about coming back on. You're not welcome here anymore. The Cubs have the Dodgers right where they want them. Lulled into a sense of security and thinking there will be clinching with Alyssa Milano downing Dodger Dogs. The Cubs are going to win this series not because they have the better talent on the field. Not because of vodoo. Not because of some priest. The Cubs are going to win this series because no one expects them to do so. The Cubs won three games in a row 14 times this season. What's one more? F*ck three games, how about 11 straight?